For the past 25 years, Design Data has been a leading presence at the North American Steel Construction Conference (NASCC), hosted by the American Institute of Steel Construction (AISC). This year, Design Data – the longest continuing exhibitor at NASCC – was joined by 200 other exhibiting companies at the conference, held April 2-5 in Nashville Tennessee. A number of Design Data staff was on hand to demonstrate SDS/2, train customers on the software, and support our industry partners. Design Data also unveiled EAD/2, our new engineering analysis and design module that is fully integrated with SDS/2. 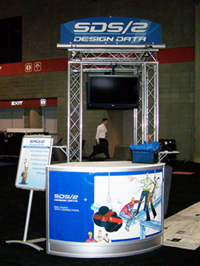 As in previous years, Design Data's customers played prominent roles at the conference. Mark Holland, PE, with Paxton & Vierling Steel, was a featured speaker at the “BIM Instruction for the Fabricator” short course. The course was designed for the fabricator who is interested in using Building Information Modeling, but is not sure where to start. Holland's presentation centered on how industry can use BIM and included his experiences in exchanging data. The presentation was followed by an hour-long panel discussion with a question and answer session. Brian Cobb, of Structural Detailing, LLC, presented a session titled “3D Software and Complex Hip and Valley Roof Systems.” The session helped detailers understand the benefits and issues involved with using 3D software to detail complex hip and valley roof systems. The presentation showcased projects Structural Detailing completed using SDS/2, including the Chattanooga (Tennessee) Convention Center, the Brentwood (Tennessee) Baptist Church, and the Harpeth Hall library and Belmont University Curb Event Center in Nashville. Look for Design Data in two locations at next year's NASCC conference: SDS/2 will be featured in Booth 801, and EAD/2 will be demonstrated in Booth 635. The 2009 conference will be held April 1-4 in Phoenix, Arizona.